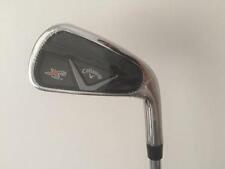 callaway apex cf 16 irons Left Handed. Condition is Used. Xp 95 s300 shafts Dispatched with eBay delivery – Shutl 1 day. A LOVELY SET OF THE FAMOUS CALLAWAY APEX CF16 COMBO IRONS, 5 TO PW. START THE SEASON WITH CLUBS TO BE PROUD OF. UST Mamiya recoil ES 780 F4 (Stiff Flex). - 7 Irons (4-PW). These clubs are only 4 months old, used by a professional golfer who doesn't play very often, due to this the clubs have been treated well and are in fantastic condition. T h i s i s a s e t o f A p e x C F 1 6 4 t o P W Irons. T h e y h a v e a X P 9 5 R 3 0 0 shaft. There i n g o o d condition w i t h nearly n e w m u l t i c o m p o u n d g r i p s.
New listingCallaway Big Bertha Fusion 2 & 3 Irons. You Wont Be Disappointed. Heads 8/10. Callaway Apex UT 18* Utility iron - Miyazaki tour shaft. Flex is stiff. Plays 3 iron length. Head in excellent condition, has new golf pride your velvet cord grip put on a fortnight ago. Shaft is excellent but does have a couple of small wear marks as highlighted in the pictures. These callaway Xr pro irons with kbs tour 90 stiff shafts are in great condition. Check out this link for more info if you haven’t already. Rick shields xr pro review. https://youtu.be/RY7NKg9BqbI These are excellent clubs and I don’t think any purchaser will be disappointed with performance and condition. Grips have a lot of life left, shafts are in very good condition as are the club faces. No major chips and grooves are in great shape. Callaway Mens XR Irons - 5 to PW - A flex graphite, great condition. These irons have had little use, so are in really good condition. They are A flex graphite shafts so will suit golfers with slower swing speed and senior golfers. CALLAWAY XR PRO IRONS 4-PW KBS TOUR 90 REGULAR EXCELLENT CONDITION. The clubs are in great condition and have been well looked after. Club ratings; Heads - 8/10 Shafts - 8/10 Grips - 7.5/10 Grab yourself a bargain for these fantastic clubs. Only selling due to a recent upgrade Any questions please email me. Thanks for looking and if you are bidding good luck. Callaway Steelhead XR Irons. Condition is Used. Dispatched within 1 day. 5i to sw. Recently gripped with a thicker Lamkin grip giving a lot more feel and control. Excellent distance clubs. CALLAWAY X TOUR 4-9 GOLF IRONS. Condition is Used. Dispatched with Royal Mail 2nd Class. Heads have a few little marks from a seasons play but still look very good. One specific mark is on the 7 iron (see pic) where a stone caught the face near the toe. I do use headcovers on my irons. 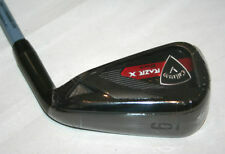 New listingCallaway XR Pro 7 iron Golf Club with Steel KBS Tour V 90 Stiff Shaft. Callaway XR Pro 7 iron Golf Club with Steel KBS Tour V 90 Stiff Shaft. Fantastic club. Used but is superb condition. Very little used. Standard loft, lie and length. Head 8.5 (only very minor cosmetic) Shaft 9 Grip 9 Any question please message. Happy bidding. Dispatched with eBay delivery – Shutl 2-3 days. Condition is Used. 7 irons, Project X Rifle shafts 5.5, 1/2” short. Callaway X Forged Iron. X Forged Model. Project X 6.0 Stiff Steel Shaft. SOLD BY A PGA PRO. 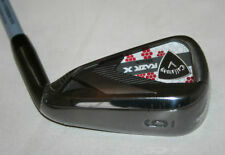 LH Callaway X Hot Pro 6 Iron Reg. Project X flighted 95 5.5 regular shaft Ex demo Fantastic club. Used but is superb condition. Very little used. Standard loft, lie and length. 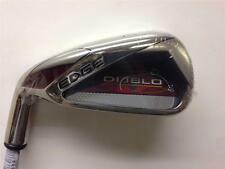 Head 8.5 (only very minor cosmetic) Shaft 9 Grip 10 Any question please message. Happy bidding. Dispatched with eBay delivery – Shutl 2-3 days. CALLAWAY X TOUR 2 IRON,new grip,cover. Condition is Used. Dispatched with eBay delivery – Shutl 2-3 days.Outstanding club with usual wear,true tempur dynamic gold shaft with no marks to club head or shaft,re-gripped with a progen grip rite and a clear view headcover to protect ! having a sort out so got to go ! Callaway XR 4 Iron. Regular Flex. True Temper Speedstep 80 steel shaft. Standard Callaway grip 9/10 condition. This has only been used several times on course and is in great condition, as shown in the pictures. Any questions please let me know! Pick-up / drop-off may also be an option, if suits both parties as I work across the UK. 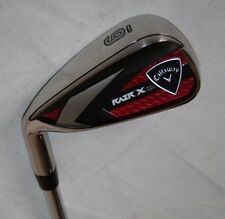 Callaway X Tour Utility Iron 18 Degree Japanese Version . Has only been used a handful of tomes and is in excellent condition. It is the Japanese tour edition and therefore rare. Men’s right hand with project x 6.0 shaft. Callaway full cord grip. callaway x14 irons. From 3-8 plus PW. Great set of clubs. Perfect for someone looking to get into golfing. collection only. Condition is Used. CALLAWAY IRONS SET X16 STEELHEAD LEFT HAND IRON SET 3.4.5.6.7.8.9. GREAT FULL IRON SET. Genuine set of Callaway irons. Top quality set of irons that still feel like new ! UNIFLEX Shafts 9/10 (marked down due to PW sticker having been peeled picture 9). Great overall condition. I always endeavour to help. Big bertha graphite shafts 5 to 10 iron. Callaway Hawk Eye VFT 3, 4 and 5 iron. Tungsten and titanium cavity backed long irons. All good condition with very recent Callaway grips. 3 and 4 have System 75 firm flex shaft, 5 has Callaway uniflex steel. I could possibly split, please ask. Post to UK mainland only. New listingCallaway X18 irons (4-SW) Uniflex shafts, RH, good condition. Callaway X18 irons x7 (4-PW,SW) No5 iron is missing. RH, Used condition but still a lot of use left in them. Callaway XR Steelhead Irons 4-AW. Condition is Used. Right handed. Mamiya recoil ES 760/F3 Graphite shafts. Excellent shafts. Regular shaft. Callaway Rogue Irons 5-pw with true temper xp95 s300 shafts. Standard length and lie. Only Used for a few months so condition of the clubs is very good (please see pictures). 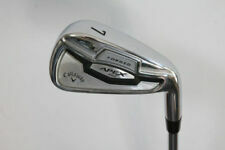 Callaway Apex UT 21 Deg Driving Iron. Equipped with KBS tour-v 110 stiff shaft. Standard grip in good condition. The shaft and head show signs of good wear as you can see from the photos. Happy Bidding. Selling my Callaway CF18 X-Forged UT Iron, 21 Deg , Stiff , in great condition, new grip hardly been used . CALLAWAY RAZR X TOUR IRONS 4-PW STIFF SHAFT. Condition is Used. There are the usual marks associated with irons knocking about in your bag but nothing that affects the striking zone. I will include a full set of generic head covers in the final price. 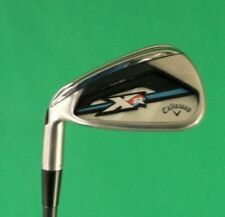 Callaway X20 Irons. 3 - PW ( including sand wedge. Shaft is rusty so its a 'free extra'). Very good condition.